Our Harcross is pure gem turquoise. The rough makes the sounds of clinking from broken glass when knocked together and it is a joy to cut. I know of no other turquoise of this quality being sold today. Discovered in 1908 and sold to Walter Godber (of the Godber-Burnham mine) it was later claimed by F.B. Cross and J.J. Harrison as the Harcross. 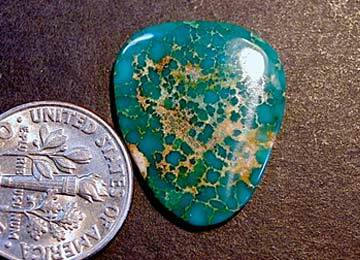 The turquoise is very hard and ranges in color from blue, bluish green, to green, with limonite giving it a nice matrix.